- Workshop scope, issues, risks, communications etc. 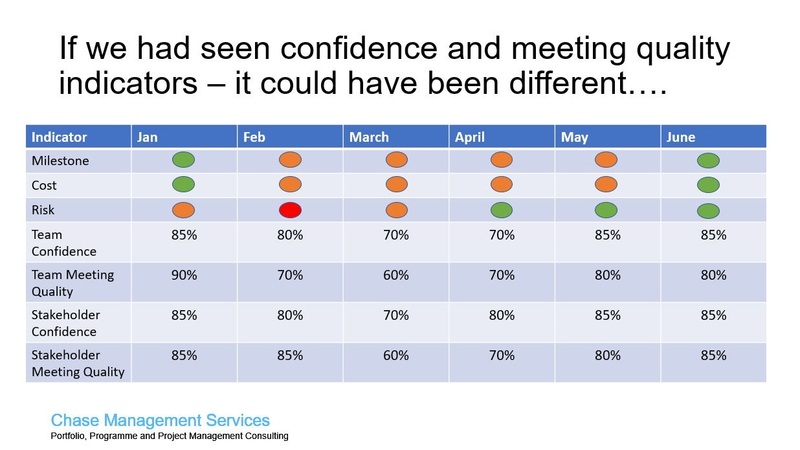 It is not just project and programme boards that can benefit from better meeting quality. Any recurring meeting - including board meetings - can benefit from a revisit on how they are working, and how they continue tot work. we can assure that the governance framework is efffective. If we dont have good tech, meeting capability and checks / balances - we can of course hope it's efective. - If you have a PPM solution, we can help you get more utility out of it, and if you don’t have one, we can help you make a case, select, implement and sustain one. - Interactive Governance Dashboard. 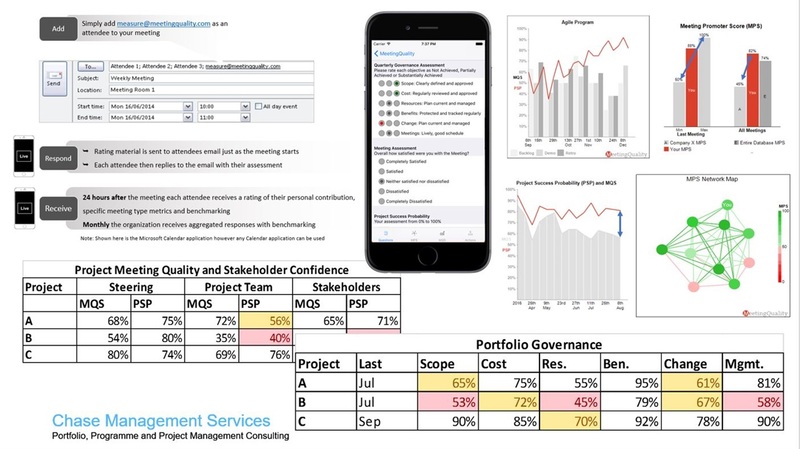 Even in the time of PPM solutions and Dashboard reporting tools - Meetings are not prepared for, data sharing is hard, capture of and interaction with meeting data is difficult – often done of paper outputs and scribbled notes. Summary and follow on capture is parochial, so progress from meetings can be poor. We can use core Microsoft Technology and a little bit of super special expertise on top to enable meeting types to automatically generate agenda, provide a place to store preparation, simplify meeting operation, generate minutes easily and follow up of the risks, issues, actions and dependencies produced. - Track your Meeting Quality. Clearly – how we all perform at meetings will determine how productive they will be, and meeting quality also provides a leading indicator on project performance. For example – increasingly fractious project board meetings will not help problem solving or decision making. Our Meeting Quality App quickly solicits meeting feedback and allows inference from trends across the portfolio – enabling better decision making and helping teams in difficulty before difficulty becomes problematic, and our Meeting Quality Service provides independent, bias free feedback on what is going on / developing with the key relationships in your portfolio. - Train, coach and mentor meetiing participation and management. It is possible to think about attendees, planning, operation, behaviour and follow up as matters to coach and improve. It is not "shameful" to seek support in these subjects, its "sensible"! 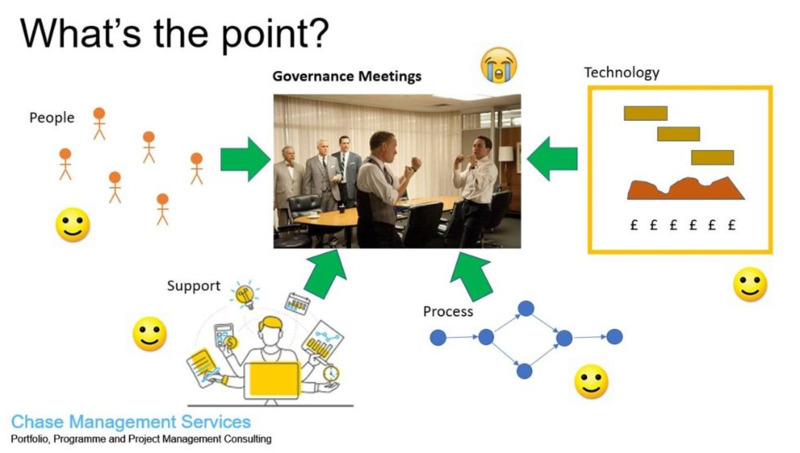 Will Enterprise Project Management Make Meetings better? Nightmare scenario – just before it happens? EPM Investment – have I forgotten something? Is your operation ready for a PPM solution?